My class is learning about gardens right now and this week we are focusing on seeds and how they grow into plants. 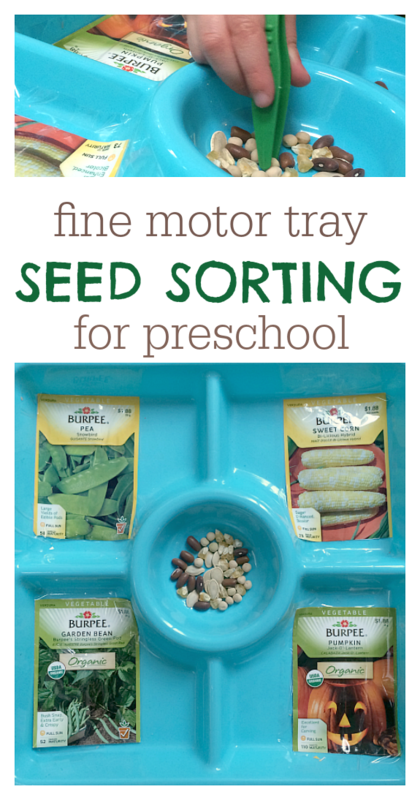 This seed sorting activity tray will be used during free choice and I will be withins arms reach since these seeds can easily be placed places we don’t want them to be like in mouths, nostrils…ears… I would never introduce an activity that I didn’t think my students could do successfully but children are unpredictable so being close by is always a great idea. Gather your materials. 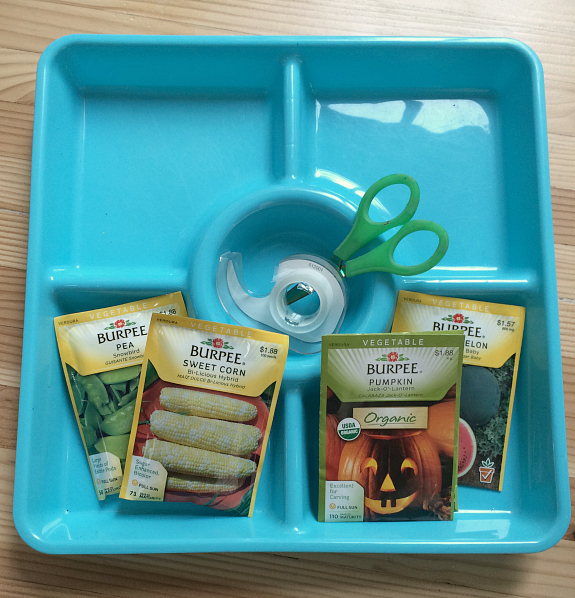 You will need a divided tray, some seed packets, tweezers, scissors, and tape. You may also want some ziplocs and a sharpie for storing extra seeds. 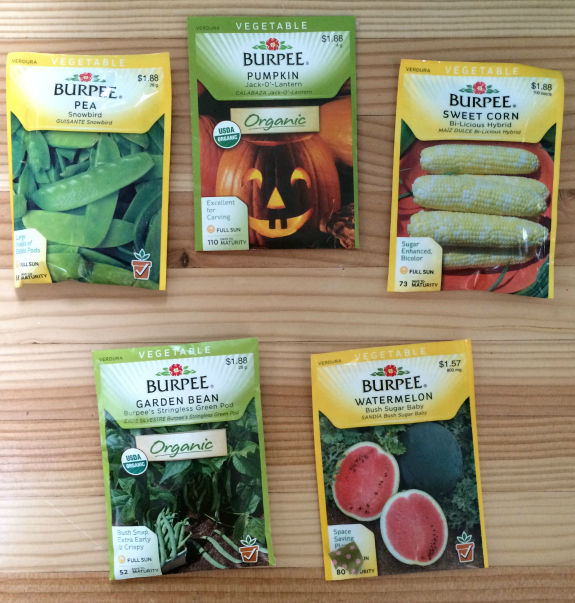 I chose seeds that would likelybe familiar to my group of 3 year olds. 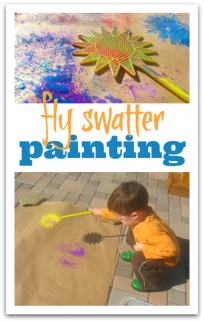 With older children throw in a few less recognizable ones for a challenge. Start by cutting the package carefully on the bottom. 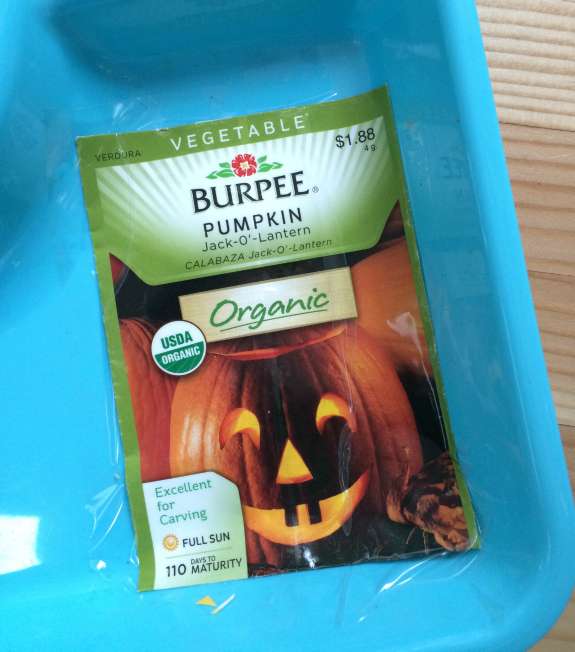 Pop a few seeds in the center section of your tray and put the rest in a labeled bag for later use. 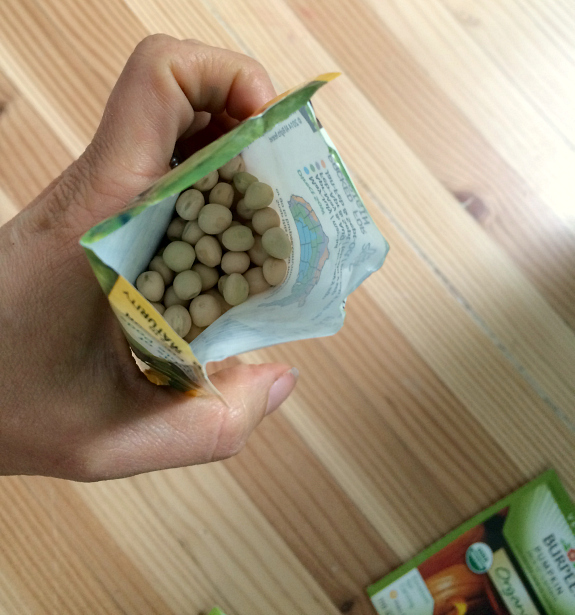 Tape the empty seed envelope to the tray. I have regular tape shown in the picture above but I ended up using packing tape. For really little guys you will probably want to place one seed of each plant in the proper section as a guide if you can’t introduce the activity yourself. If you can I would ask them if each seed looks like any of the vegetables pictured or of they have ever seen seeds like these before. Then see if they can match them to the pictures. In a free choice scenario where you may be attending to many children in a short amount of time you have a few choices. My favorite is to observe during free choice and then bringing the tray back out later at circle time to talk about the seeds adding to the students previous experience with the seeds during free choice. Then the tray will be brought out for free choice again in the coming days. 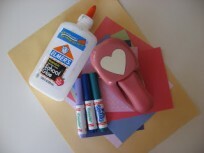 I added tweezers to this activity for some novelty but little fingers are perfectly acceptable too! My daughter tested out my activity before I packed it away into my school bag. 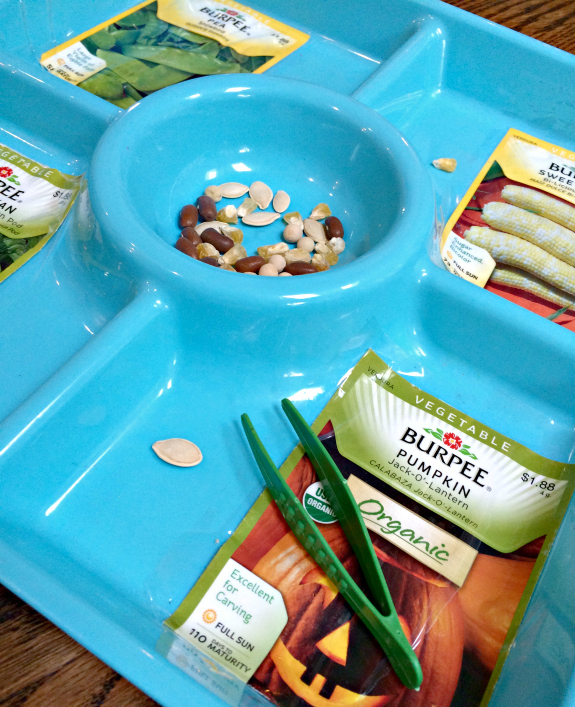 Have you explored seeds with your child or classroom? 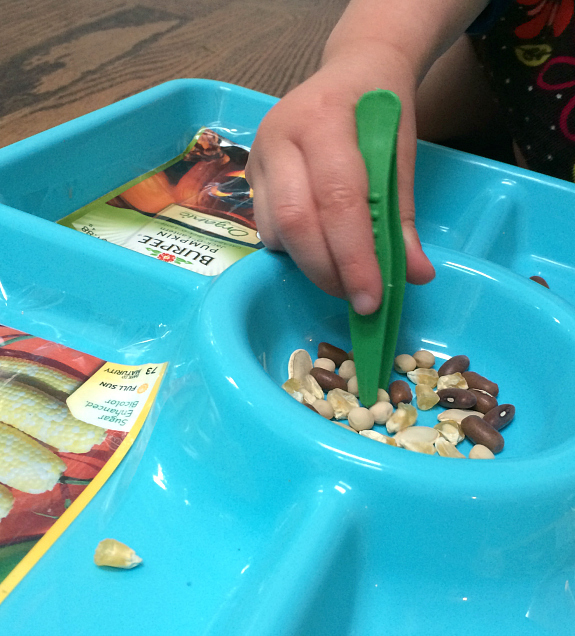 What is your favorite seed activity? Tell me all about it here in comments or on my Facebook Page. 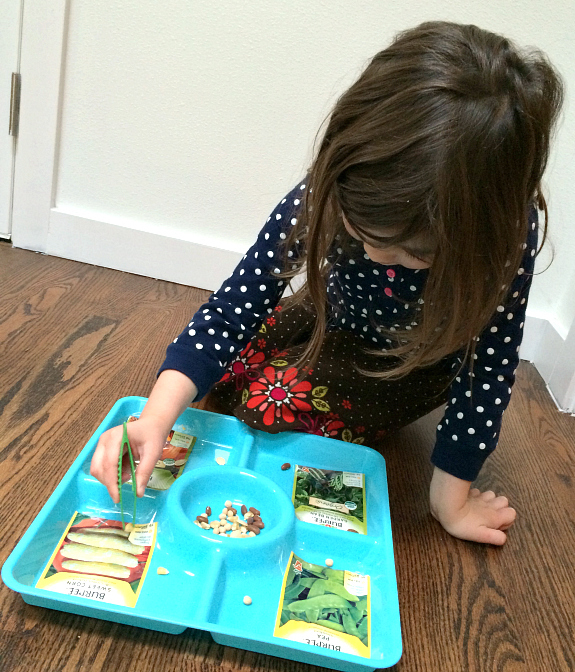 Where did you get your sorting trays? I am curious as well!!! Dollar Tree – I am pretty sure my local one still has it! Hi. Where did you get the plastic tweezers? Where did you get the tray? It is perfect! Either Walmart or the Dollar Store – I think this one came from Walmart!